It’s been a long time since writing my last fishing report, and for that, I apologize. Many of you wrote me during these past months saying how much you enjoyed reading about our customers’ fishing adventures and encouraged me to continue them. You can’t imagine how much hearing from you means to me. Thank you for your comments. Without sounding as though I’m making excuses, let me start by saying that things have been very busy, to say the least. We typically close during the month of September and October for a couple of reasons. First, there is maintenance, and lots of it. Like all things mechanical, things break down or wear out, so we take advantage of this down time to repair or replace the needy ones. Major services to the engines are performed during this time. We also do an extensive check on the electrical and fuel systems and take care of any problems. Reels are stripped down and serviced to ensure they are in top form. After all, we don’t want that BIG ONE to get away because of equipment malfunction. The second reason for taking October off is the unpredictability of our weather during this period. Big storms from the South mixed with prevailing winds shifting to the North are common during this period, often signaling the change from rainy season to dry. Although the fishing is still excellent for Dorado, Wahoo and the ever-present bottom fish, the risk of having weather-related cancellations are too high. Most often our customers traveling from abroad don’t have the flexibility to reschedule. And did I mention that my mate’s and my tired and bruised bodies need a rest also? After spending countless hours on the Internet and telephone plus a couple of trips to the US, I finally purchased a second boat. The business has grown to the point where I was not able to meet the demand during the peak fishing season. What I ended up buying is a 31’ Pursuit Center Console. The boat made a long trip from upper Michigan by truck to Port Canaveral, Florida, and then by ship to Puerto Manzanillo on Panama’s Atlantic coast. After a 6 hour trailer, it finally made it to its new port and marina in Boca Chica. 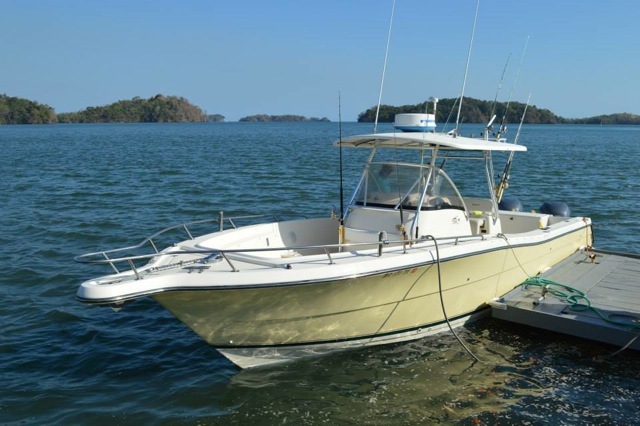 It’s fully rigged and already has had several successful fishing trips on our Pacific waters. The customer reviews have been very positive thus far. It’s wider, longer, faster and more stable that the 28 footer Pursuit. For those of you that were on the smaller but great-riding Pursuit, you will appreciate how comfortable the new vessel is. I’m very proud to add “The Zonian” to our operation. Welcome aboard! The new boat needed new equipment, so I spend a considerable amount of time searching for rods. There are many excellent manufactures out there, but in the end, I decided that the team at Seeker Fishing Rods had the best products for me. I ended up with a big order of Trolling & Live Bait rods for both spinning and conventional reels. It seems unfair to summarize several months into a few paragraphs, but that’s about it for now. My intention is to publish a consolidated report for December and January which were simply RED HOT! The number of Marlin and Sailfish in the spread this year have been unbelievable. Stay tuned!